The government will remove obstacles to doing business in Malaysia, especially for foreign investors, in order to attract more foreign direct investment (FDI), said Dr Mahathir Mohamad. Japanese Prime Minister Shinzo Abe and his Malaysian counterpart Mahathir Mohamad agreed Tuesday to move ahead with Malaysia’s plan to issue 200 billion yen ($1.8 billion) worth of yen-denominated bonds to help the Southeast Asian country address its debt woes. The Malaysian Employers Federation (MEF) is mulling legal action against Putrajaya for not following the law in revising the minimum wage to RM1,100. Total trade in September 2018 rose 2.3 per cent to RM150.83 billion from RM147.51 billion a year ago, supported by an expansion in trade with Hong Kong, Asean, Taiwan, Australia, Saudi Arabia and the US. The Malaysia Vietnam Offshore Terminal (MVOT), a joint venture between PetroVietnam Technical Services Corp and Malaysia’s MIBS Bhd, has won a US$176 million contract to provide equipment for Idemitsu Kosan to develop the Sao Vàng-Ð?i Nguy?t gas project. The 2019 Budget’s emphasis on addressing the stock of government debt and contingent liabilities is likely to narrow fiscal space and prevent public investment from driving economic activity as it did before, said the World Bank Group. The next time you hear anyone say that corruption investigations don’t matter, remember Equanimity. Aeon Group, which is mainly known for its retail chain and financial services, is targeting to go paperless by rolling out its e-wallet to consumers by the second half of 2019, said Aeon Credit Service (M) Bhd Managing Director Kenji Fujita. Malaysian Prime Minister Mahathir Mohamad was on Tuesday (Nov 6) conferred one of Japan’s highest awards for his contributions in strengthening bilateral ties. IPC Shopping Centre and MyTOWN Shopping Centre in partnership with IKEA Malaysia are proud to unveil the “11.11 Carnival”. This is the first time the online 11.11 shopping phenomenon is brought on-ground to a physical retail environment. From 9 to 11 November 2018, IPC and MyTOWN will host multiple brands to provide shoppers with an even bigger and better unique shopping experience. The status of broadband internet packages affordability in Malaysia remained unchanged from last year, even as neighbouring countries in the regions experience varying changes to their rankings. Malaysia will impose an excise sugar tax on sugar-sweetened beverages starting April 1 2019, in an effort to combat rising overweight and obesity levels in the country – but experts are less than optimistic about its efficacy. 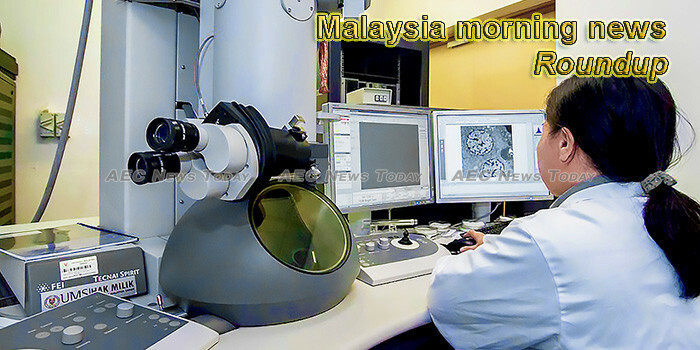 Malaysia’s battle with mosquito-borne diseases is about to take a turn for the worse. Growing up in a village, Malaysian poet Zurinah Hassan was told she should be seen, not heard. Analysts have downgraded Malaysia Airports Holdings Bhd (MAHB) after the government’s plan to set up the world’s first airport real estate investment trust (REIT) and departure levy for outbound air travellers. Shares of Genting Malaysia Bhd (Genting), Malaysia’s premier gaming stock, was affected by the spate of casino charges introduced in Budget 2019 last Friday. Leading Malaysian politician Anwar Ibrahim said Tuesday a fugitive tycoon accused of ransacking a state investment fund will be given a fair trial, while hinting that more former officials could be tried on corruption charges. THE Sarawak state assembly today unanimously agreed to form a consultative committee to draw up and advice Sarawak representatives in the Special Cabinet Committee on the Malaysia Agreement 1963 (MA63). The Convention on International Interests in Mobile Equipment (“Convention”), commonly referred to as the Cape Town Convention, is an international treaty intended to standardise transactions involving movable property.